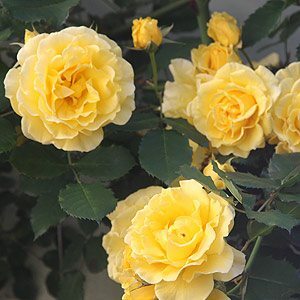 Gold Bunny Rose | Nurseries Online. Bred in France the Gold Bunny rose is an outstanding yellow floribunda rose, in fact one of the most reliable roses we have grown. Flowering early in spring with wonderful golden yellow flowers we grow this as a climbing rose and it is a prolific repeat flowerer for us. The standard variety was introduced back in the 1970s and is a proven performer, an excellent substitute for those who do not want the white iceberg type. The climbing variety is a sport and was released in the early 90s. It will easily get to 3m and takes well to pruning. Flowers appear in clusters from spring through to autumn, and in a warm winter Gold Bunny will push out a few smaller flowers as well. Regarded by many as being one of the best yellow flowering floribundas, we can agree with the assessment, although ‘Graham Thomas‘ is another good selection. The standard variety is best planted in full sun and staked when young. we do tend to stake all of our standard roses due to possums, the stakes help provide support for the roses. The climbing variety grows well when planted against a wall in a sunny position, we use wire supports and clip the rose onto these. This makes pruning easy, especially when you wish to cut back hard. Choose a position with at least 6 hours sun a day. Dig the soil over well and dig in some compost and aged cow manure. Put in a climbing frame or trellis if required. Plant at the same depth the rose was in the container. 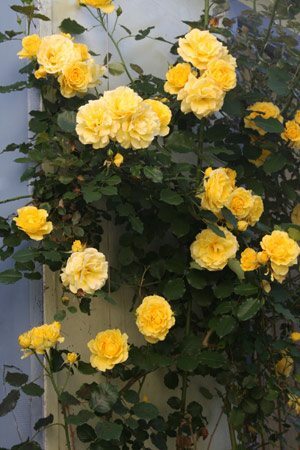 Attach to the trellis with soft rose ties. Water deeply each week through the first summer if dry. Fertilise each spring with a specialist rose fertiliser or aged chicken manure, cow manure or other organic compost. We must admit that we spend very little time caring for this climbing rose. We prune back hard once a year in June or July and then just cut back any errant growth as required. We usually cut back by 1/3 or more. As for fertilizer, once a year in early spring seems to keep Gold Bunny a happy rose. We rarely water at all, however we do mulch to provide a cool root run. One of the best yellow flowering roses we have ever grown, we can see it from our kitchen window and without fail Gold Bunny is rose that puts on a magnificent show every year. How much should they cost ? Around $15 for a climbing type, and the same as a standard, postage would be extra.